Town Hall Station is right next to the Queen Victoria Building (QVB), an ornate Romanesque building completed in 1898. 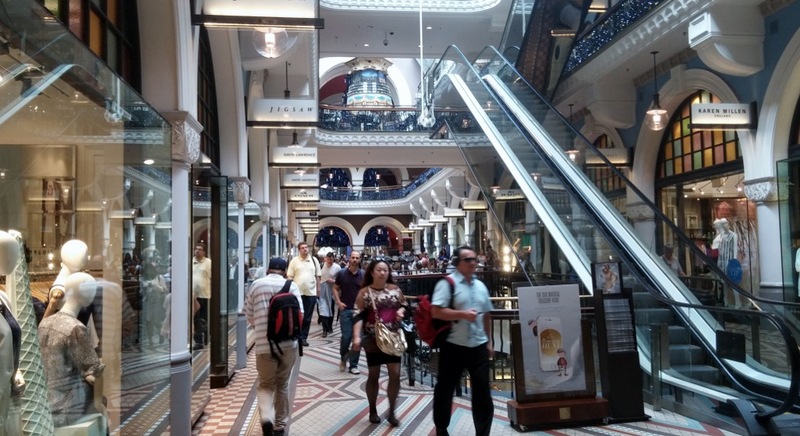 Originally a concert hall, it is now an indoor mall and a tourist attraction in its own right. From the station I tried to follow the directions to the Four Points that I had gotten from the concierge. These turned out to be less than worthless. 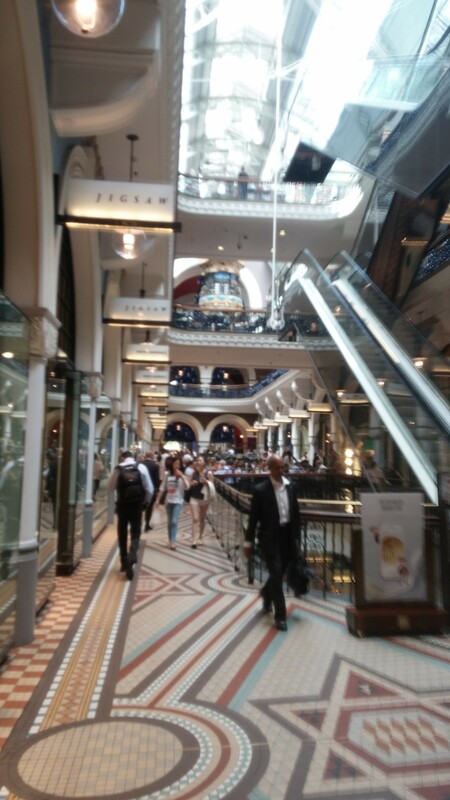 The easiest way to the hotel from the QVB is to take Market Street down the hill toward Darling Harbour for four short blocks, turn right on Sussex, and the Four Points is 100m on the left. My room was not ready when I arrived at9:30am. It was a hot day and I wanted to shower. The front-desk clerk offered the fitness center facilities. I was pleasantly surprised to see that the shower there was actually a completely private mini suite with a sitting area, bathroom and shower. After a leisurely shower and change of clothes, I went back to the front desk to turn in the fitness center key, and low and behold, a room was ready. 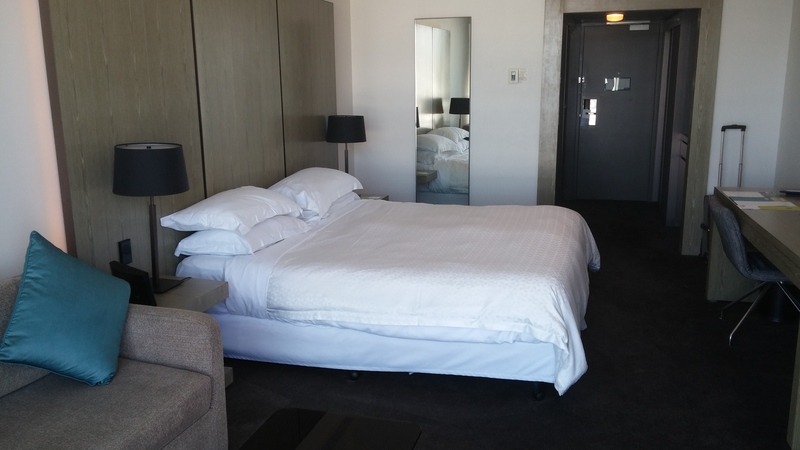 The room was a Premium Deluxe Harbour View room. 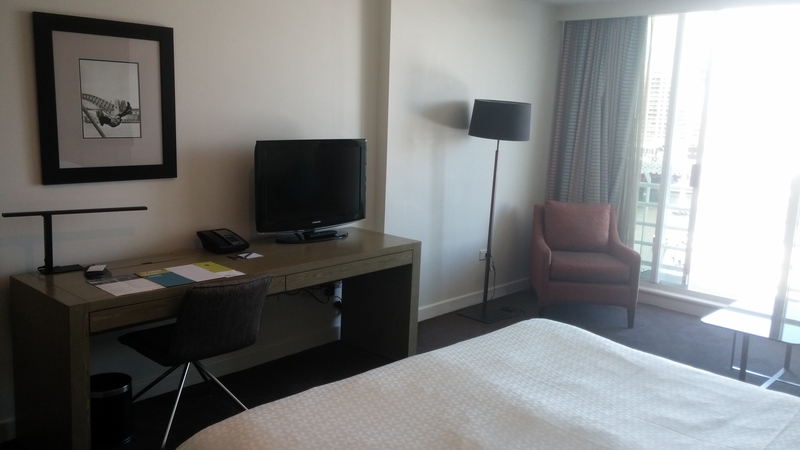 Not a suite but very nice for a solo two-night stay. 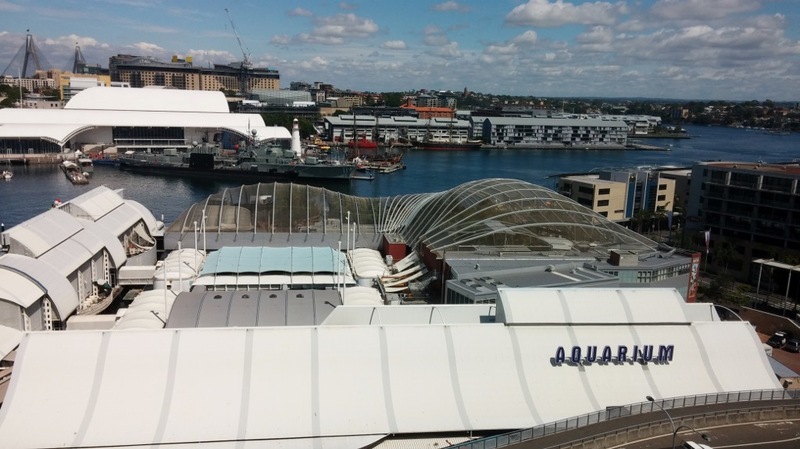 The room had a great view of Darling Harbour, Sydney Aquarium, Madame Toussaud’s and Cockle Bay. 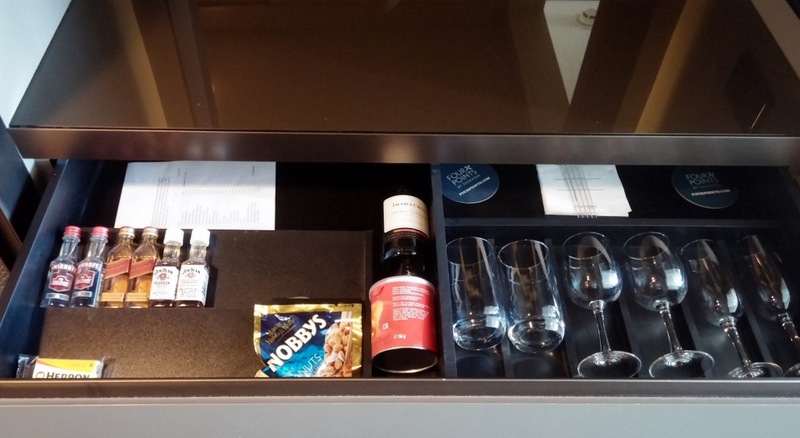 There was a small balcony, sofa bed and chair, and a well-stocked minibar. The bathroom was standard Four Points except with a walk-in shower instead of a tub. The cable TV had a good selection of local and international channels. It even offered American sports shows from time to time rather than the steady diet of football (soccer), rugby and cricket that I’m usually forced to watch in this part of the world. 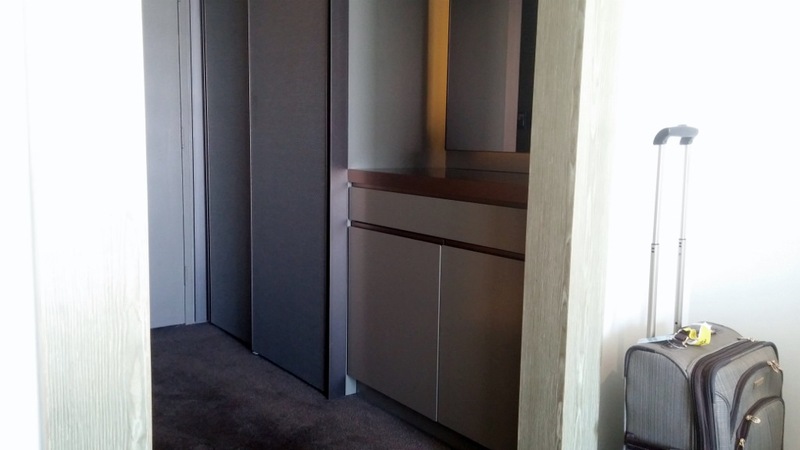 Other than the possibility of a suite upgrade, Four Points aren’t great for Platinum recognition. I selected the 250 points rather than the continental breakfast. It turns out that the hotel would have given Platinums the full breakfast buffet rather than just a continental breakfast but they didn’t mention this at check in. What I learned is that It never hurts to ask for the full breakfast, especially outside of the US where a full breakfast used to be pretty standard for Platinums at Four Points hotels. I tried the breakfast buffet in the lobby restaurant the next morning. 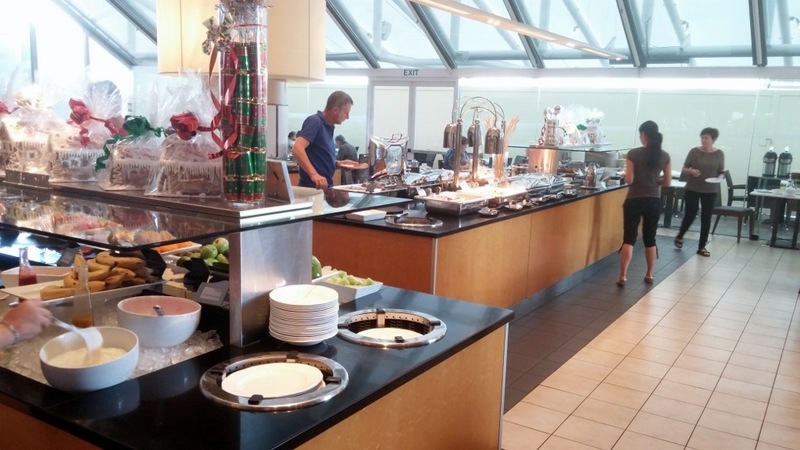 In terms of selection and quality, it was comparable to a typical Westin buffet in the US. 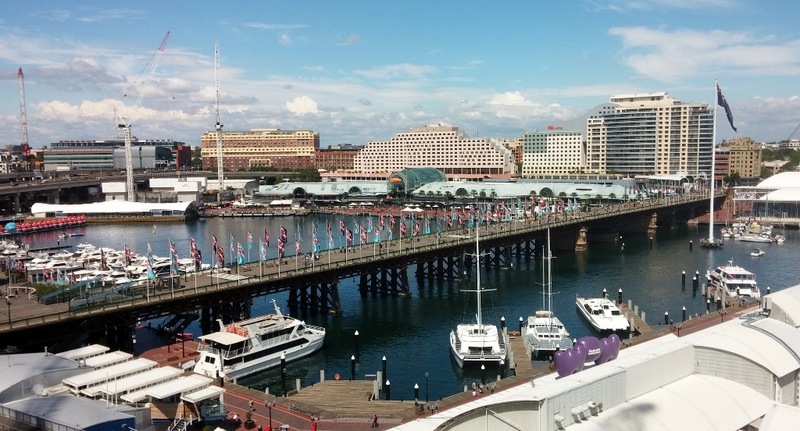 The Four Points Darling Harbour is located between the main business district and Darling Harbour.which is an off shoot of Sydney Harbour. 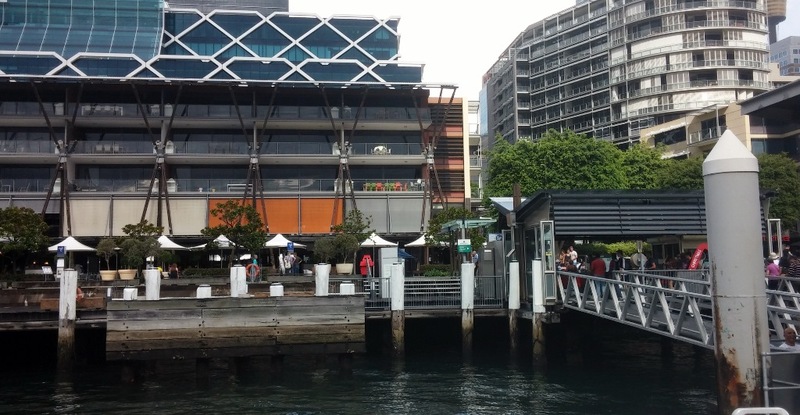 In addition to all of the attractions and restaurants at Darling Harbour, there are a bunch of very good Korean and Chinese restaurants about three blocks away. 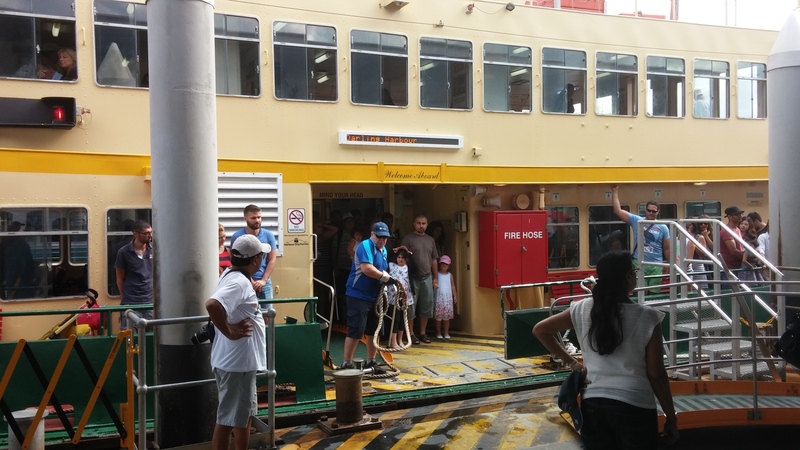 A three-minute walk gets you to King Street Wharf where you can take a scenic ferry ride under the Harbour Bridge (Coat Hanger) to Circular Quay and the Opera House. 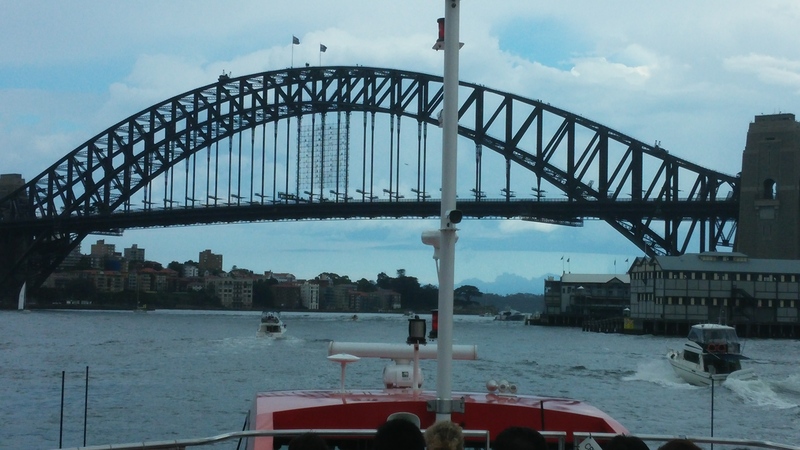 This is a view of the Four Points from the ferry at King street Wharf. 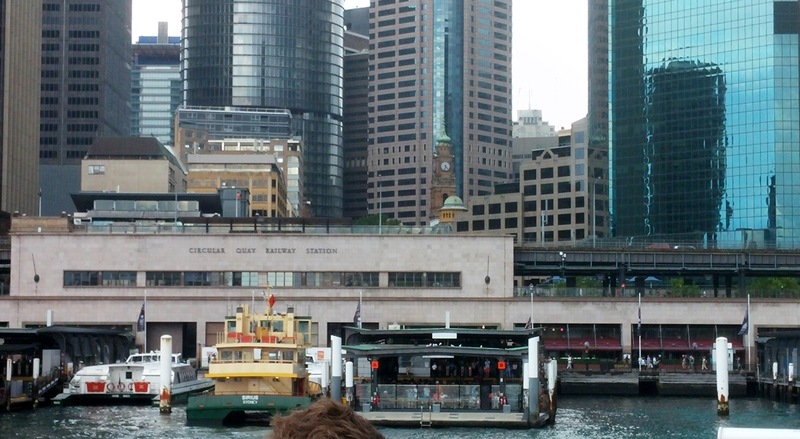 Circular Quay has trains and ferries to all points in the Sydney area. 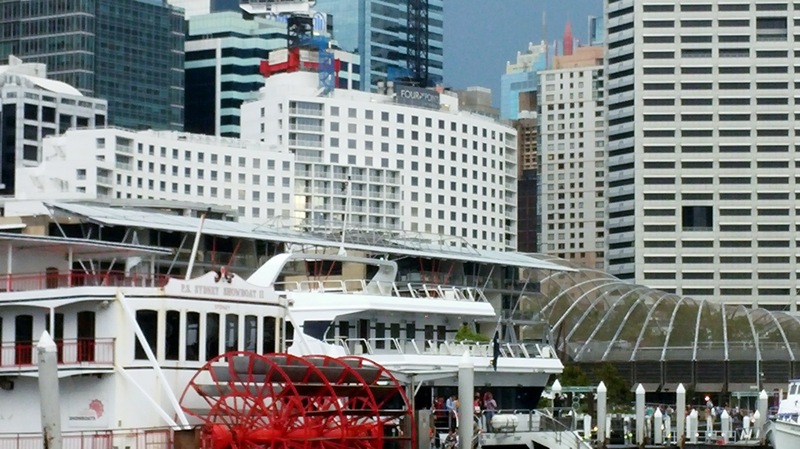 The Four Points Darling Harbour hotel would be a ideal location for couples or a family vacation as there is a wide range of easily accessible and interesting things to do for adults and children alike. On the morning of departure I checked the delta website and saw it was soliciting volunteers for the SYD-LAX flight. I put in a $500 bid. After a workout at the fitness center, I skipped breakfast and headed for the airport on the Rail Link train. I arrived at the counter almost three hours before the flight just after check in opened to find that no more volunteers were needed. 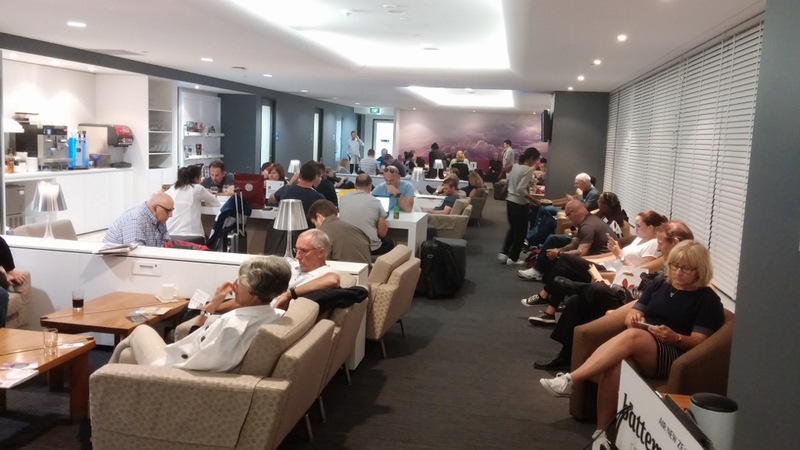 As a business-class passenger, the ticket agent gave me a pass for the express security and customs lanes and directions to the Air New Zealand lounge. 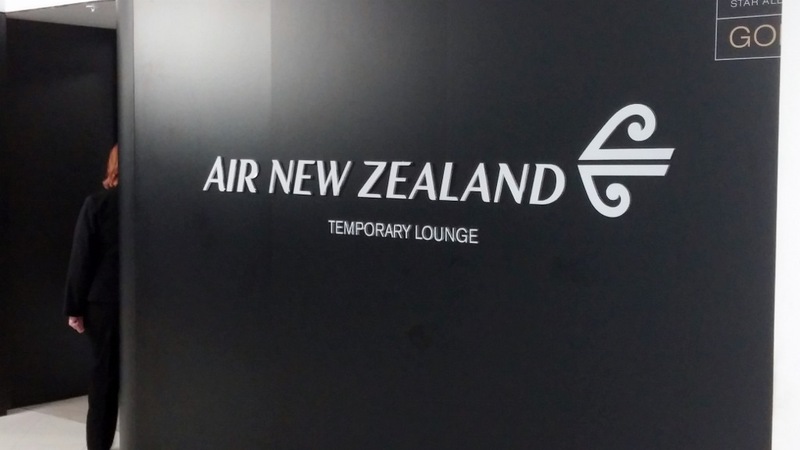 Air New Zealand was renovating its lounge and was utilizing a temporary space on the lower level of Terminal 1. When I arrived, the lounge was packed. It made the B10 club at ATL look roomy. The lounge emptied after they announced boarding for a JetStar flight to Auckland. There must have been 40 or 50 people in the lounge on that flight. 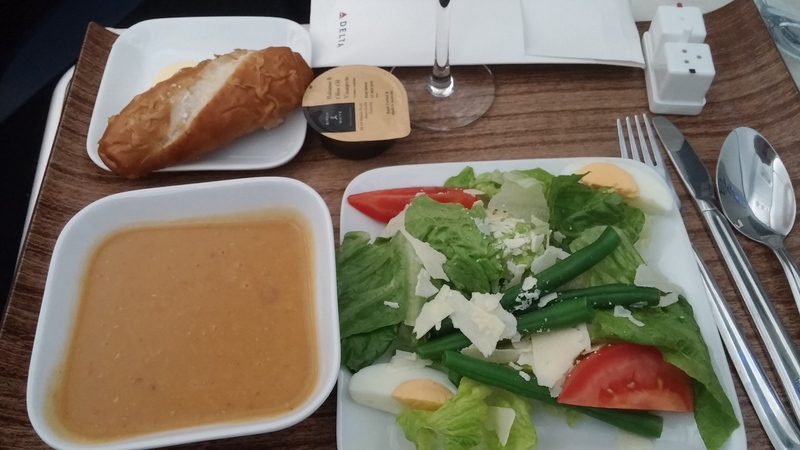 The lounge offered mid-day food and beverages comparable to Skyteam international lounges, soup, cold sandwiches and wraps, fruit,and cheese. 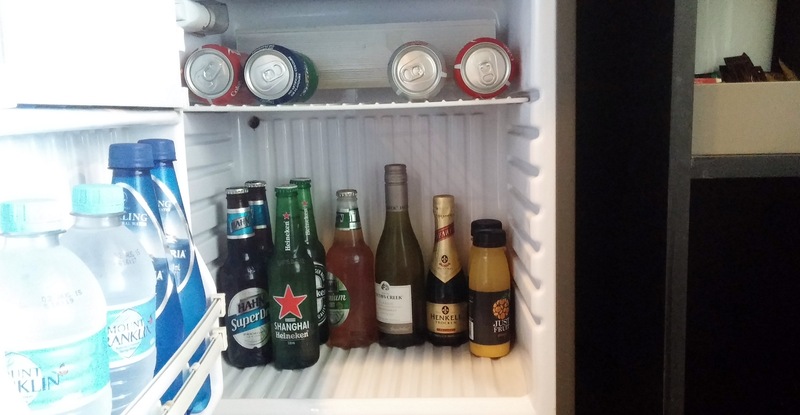 The bottled beer selection included several Australian and international brands. No skunky beer. The lounge also had a hot dog cart where you could make your own jumbo frankfurter with all the fixings including “American” mustard. Delicious. The boarding gate is just upstairs from this lounge. 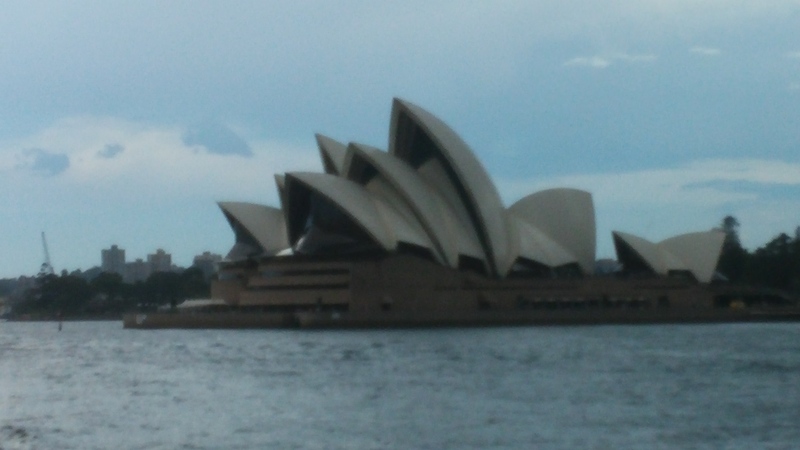 I went there about an hour before departure. Before getting to the seating area, passengers had to go through additional security screening. The flight boarded about 30 minutes late apparently due to catering and a delay in getting the plane to the gate from where it had been parked after arriving from LAX that morning. 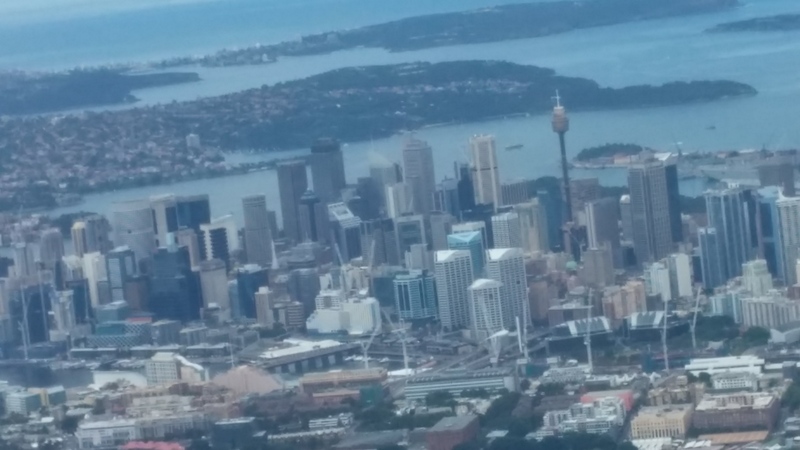 Our departure out of SYD flew directly over the Four Points and Darling Harbour and offered a great view of downtown Sydney, the Opera House, the Coat Hanger and Manley Beach on the Pacific coast. My seat, 3D, was on the side that had the best view. 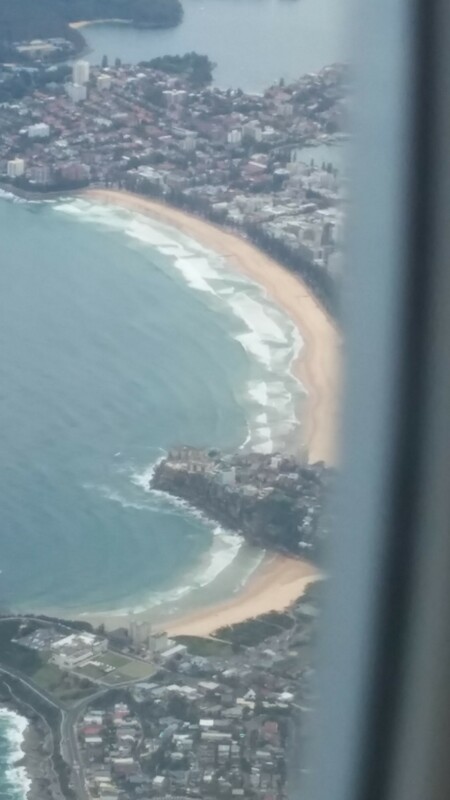 Leaving the Australia coast, the captain gave us the bad news that our arrival in LAX would likely be 30 minutes late in accordance with the late SYD departure. 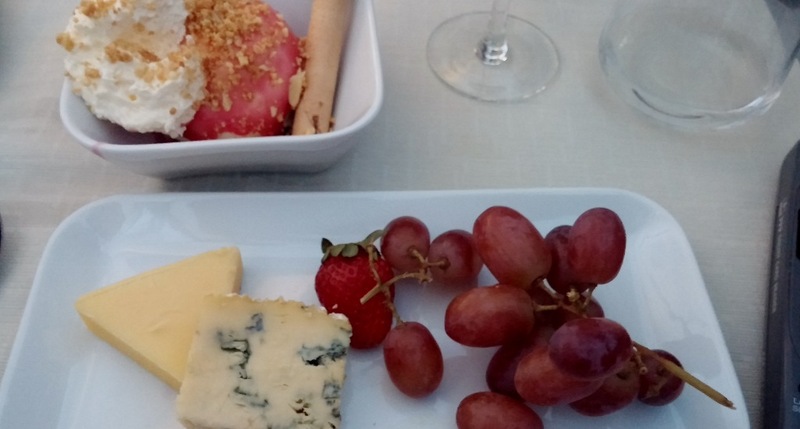 The flight attendants started the beverage and five-course dinner service shortly after reaching cruise altitude. Prior to departure I’d given my dinner order, braised beef. 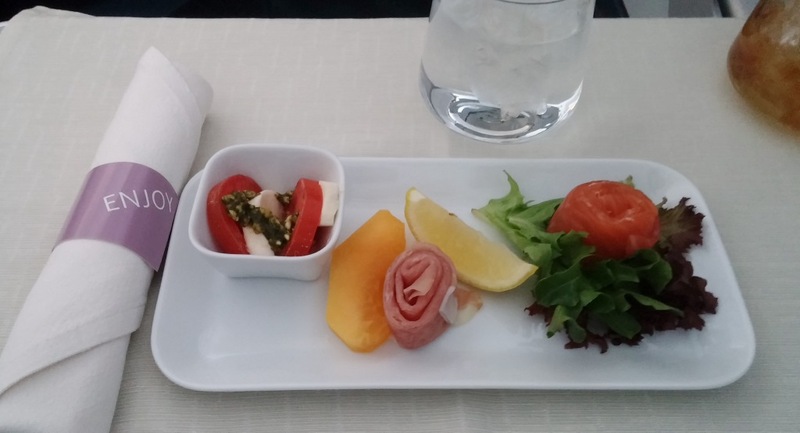 Unlike other airlines I’ve flown, delta FAs claim to have no control over how beef is cooked. I don’t know why delta goes to the expense of paying for nice fillets if the only way they can serve it is well done. 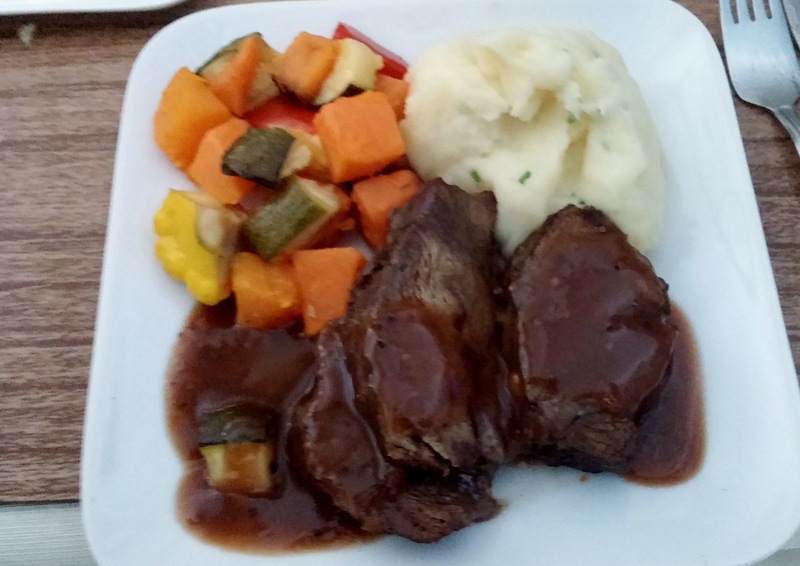 I didn’t mind if the braised beef was well done and it exceeded my expectations as far as taste and texture. In addition to the mid-flight snack, I like the snack basket that the FAs keep in the galley. It is nice at my convenience to grab some munchies to go with a beer and a movie. During the flight, I could tell from the flight-following display that we were not making up time. The captain confirmed this while breakfast was served 90 minutes out. He assured us that delta was re-booking those (me) with close connections. I did not know how that would affect my upgrade. 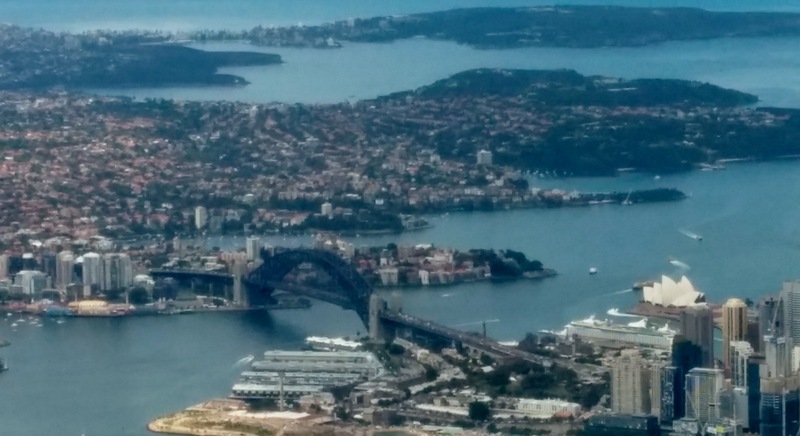 When I checked in Sydney, I was still on the GU waiting list for my LAX-ATL flight. Checking the delta app after landing in LAX, I could see I had been rebooked in first class on the the ATL flight immediately after my original flight plus there were additional options in first going through DTW, MSP and SLC. I didn’t confirm any of these flights since I didn’t know the aircraft being used and if possible I wanted to route back through JFK to try that BE experience again. 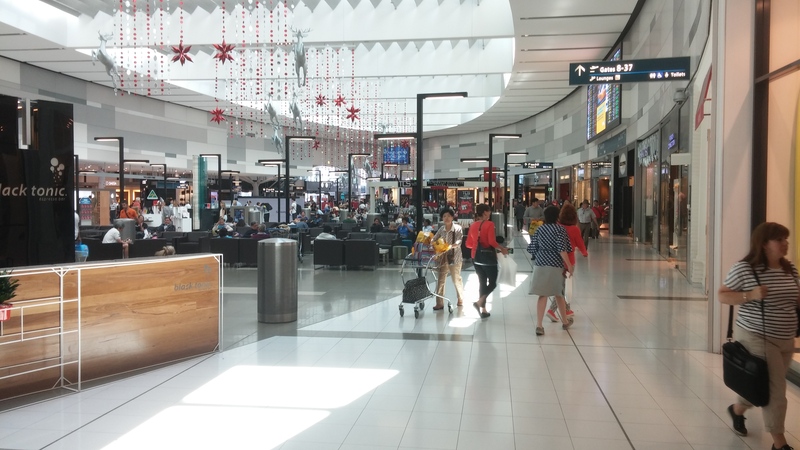 Getting through customs was a breeze thanks to the kiosk machines. I don’t think Global entry saves much time in most cases especially when I’m one of the first off the plane. There was supposed to be a delta representative outside of customs to help with re-booking. I did not see anyone unlike the flight from JFK to LAX when a Global Services rep met me in the jetway with a sign with my name. ATL flights were leaving from Terminal 6 so I went to the Alaska Boardroom. This lounge is quiet and relaxing compared to the T5 skyclub. In the Boardroom I got on my laptop to get the details on all of the options for gertting to ATL before calling the DM line. I confirmed a flight to ATL on a 737-900, my favorite single-aisle delta plane. This flight also looked over sold so I made sure I was first in line to volunteer. At boarding I was second on the volunteer list. It did not look good for the bump so I boarded through the SP lane along with Zone 2. Boarding so late, there was little overhead space in first. I wedged my backpack into an overhead bin and a FA put my carry on in the closet. Another first-class passenger (the guy who was first on the volunteer list I think) boarded after me. He had a devil of a time stowing his gear. There seems to be less overhead space in first on 737-900s compared to other single-aisle, main-line aircraft. Also, the bathrooms, even in first, are tiny. Everything else about this plane I like. Even sitting in 1D with limited legroom on a cross-country flight was enjoyable. Before departure the FA took our lunch orders. She started in row five and worked her way forward. When she got to me, she only had the delta burger, which was my first choice anyway. When we deplaned in ATL I had to wait for the other first-class passengers to get off so I could get my carry on from the closet between first and coach. 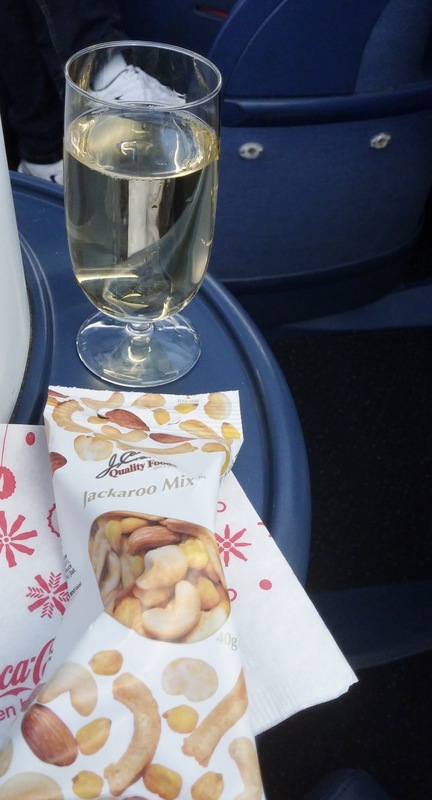 As I waited, I happened to catch a small glint of something shiny in the pocket on the bulkhead in front of seat 1C. I had a close connection and was more interested in trying to get back to my bag and head to the gate but decided to take a closer look. It turned out that my seatmate had left his IPod. I gave it to the FA, and he was able to catch up to him in the jetway. If my carry on had not been stowed in the closet who knows if I or anyone else would have seen the IPod and if he would have gotten it back. I was the last first-class passenger to board the flight to CLT. However this MD-90 had plenty of overhead space in first. Delta allowed 73 minutes for this 36-minute flight. With such generous schedule padding it is no wonder that delta’s flights are often on-time. But not this flight. As we taxied out, the pilots found a problem while running the pre-flight checklist. We pulled over onto a different taxiway to check it out. After 10 minutes or so, the captain informed us that the left generator was faulty and we would return to the gate. Getting a gate, making the repair, and completing the paperwork took about 30 more minutes. We finally arrived in CLT almost 30 minutes late at desolate Terminal A. The four-day MR with GUs was fun and took me closer to my delta and SPG goals for the year. 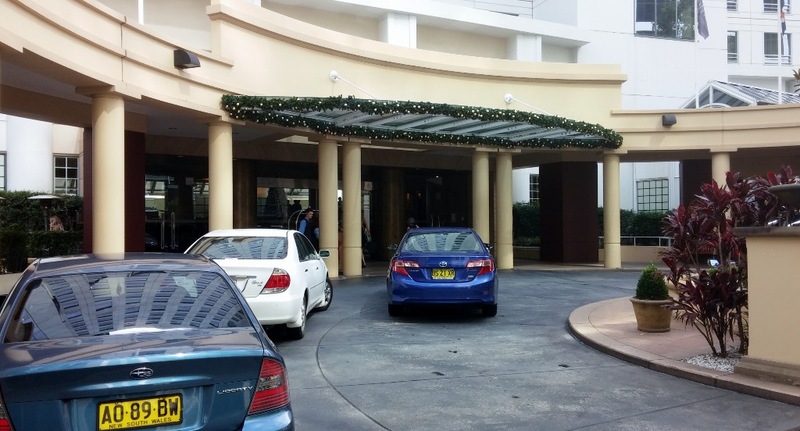 I netted 21,155 MQMs, 47,600 RDMs for 5cpm and 3,243 Starpoints, and two nights SPG credit. This MR also revealed that while GUs are great for flying business class for the price of coach, they can be tricky if you are not confirmed at booking. 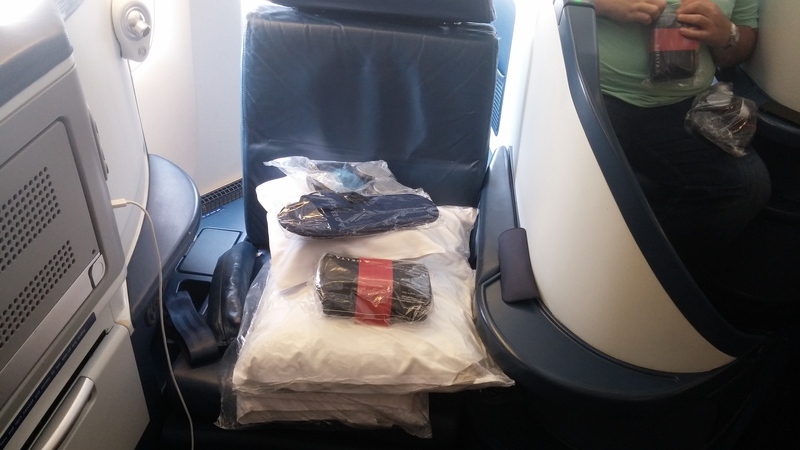 If you are placed on the waiting list, it is possible to be upgraded on a domestic segment but not on the international flight and still lose the GU. Also, it appears that complementary medallion upgrades are given out before waitlisted GU upgrades if you are waitlisted on a domestic segment. Finally, delta DM reps and supervisors are still sorting out the process for handling these certificates in various situations. Delta’s terms and conditions for GU certificates do not provide a satisfactory expalnation either.